Hi, we are Susan Courtney and James Hardiman, and we live with our dog, George, and our cat, Alice, in Hampshire, in the UK. We walk because we enjoy it, and we are fascinated to find out precisely how and why walking is good for us (and you). Between us we have (August 2010) 123.5 year’s experience on this earth; our walking is designed to increase this significantly, and make us happier, healthier, and more intelligen. This website will explain exactly how that happens, so that you can benefit, too. 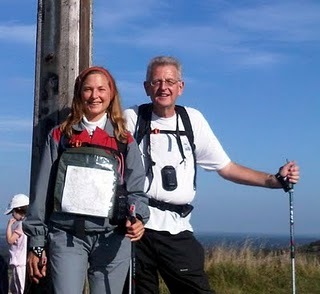 We are afiliated to, and qualified with, the International Nordic Walking Federation (INWA), and British Nordic Walking. We have walked, and taught Walking for Happiness in the UK, Malaysia, Thailand, New Jersey, Florida, St Martin in the French West Indies, Puerto Rico, and the Bahamas. We are currently training with a group of people to Walk for Happiness to the summit of My Kilimanjaro in February 2012. We believe we have a significant role to play in improving health, but don’t just take our word for it, see what the doctors have to say about Walking for Happiness. I love your video, “The World’s Most Unlikely Personal Trainer!”, it says so much about Nordic Walking and what it can do for so many, would you allow me to put a link from YouTube onto the Nordic Walking page of my web site http://www.nordicwalkingcambs.com. Thank you! I would be honoured. I’ve been looking at Quantum Touch on your website; I’m intrigued.